Hey guys! I was fortunate enough to try out a new (to me at least) skin care device without spending a single centavo. I'm talking about the Neutrogena Wave Duo bought by my cousin for half the price in Guardian, a popular store in Singapore. The device has an oval shape with one end serving as handle and the other having a flat velcro-like base for attaching the cleansing pads. I forgot to ask my cousin if the cleansing pads were already included but based on Neutrogena's website, you get 2 weeks supply of cleansing pads as part of the kit. The cleansing pads are cottony in texture yet very sturdy. To start, just attach a disposable pad onto the velcro end of the device. Notice how the mid part of the cleansing pad looks moist? This is because each pad is presoaked with foaming cleanser. Just wet the pad under running water to activate the cleansing pad. Turn on the power button and select your desired speed. Speed 1 is for gentle daily cleansing to remove dirt, oil and makeup while speed 2 is for deep-pore cleansing to give your skin an extra boost. Gently massage on your face in a circular motion. Remove the used cleansing pad and wash the device under running water to remove any remaining residue. 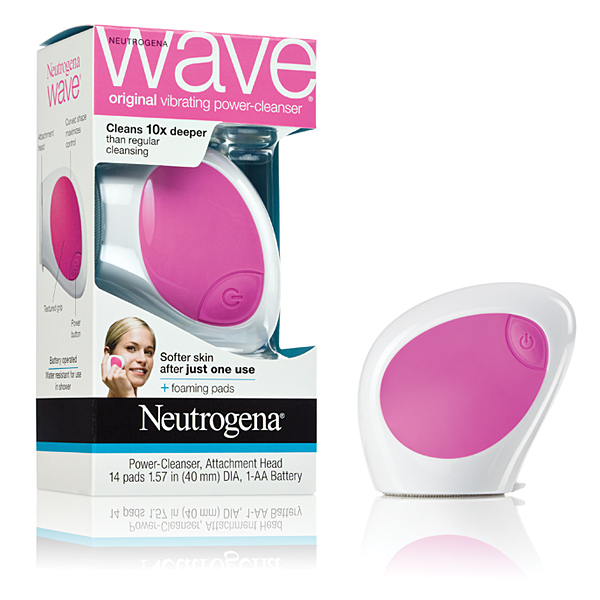 What I love about the Neutrogena Wave Duo? First thing is its handy size which is comparable to a small computer mouse hence very suitable for travel. It's also easy to use and is more affordable than other cleansing tools. Being battery operated also makes this stand out from the rest. This cleansing tool doesn't have a built in timer so it doesn't shut off on its own. The length of cleansing time relies on how long you desire to use it which can be quite tricky on my part since I tend to get lost when using it because I love the way it feels on my face. There are a few things that I'm not loving about it. First is the flat cleansing pad which makes it really hard to reach the sides of your nose and the areas around your eyes. Being battery operated can be a burden sometimes especially when you run out of extra batteries. It also limits your choice of face wash since the pads are already presoaked with moist-activated cleanser. Good thing Neutrogena came up with different varieties of cleansing pads to suit your every need. The Gentle Exfoliating Pads with microbeads to sweep away pore-clogging impurities, Foaming Pads (included in the Wave Duo kit) that promises to help clean your skin 10x deeper than traditional cleansing, and the Shine-Free Blemish-Free Pads that help absorb oil quickly and remove blackheads. Overall, I like the Neutrogena Wave Duo but not that much to purchase one for myself. Although it's more affordable than other cleansing tools, still it's not a cheap buy considering you need to purchase cleansing pads every month. The device costs $16.99 plus $6.49 for a month's supply of cleansing pads, that's almost $78 a year on cleansing pads alone! I'm also not too crazy about the fact that I don't get to use other brands of facial wash unlike with the Clarisonic or Olay Pro X but then again, it's like comparing apples and oranges. If you're open to try and add something new to your skin care regimen, then I guess it won't hurt to get a Neutrogena Wave Duo. If you're on a limited budget, you may get the original Neutrogena Wave instead. It's the cheaper version which doesn't have speed options and is being sold at around $10.99. But honestly, I think you're not really missing out on anything big if you don't get either of them. How about you? What do you feel about home cleansing tools? Have you tried any of them? Which do you think stands out? Do share your thoughts on the comments section below. Thanks for reading and have an amazing week!